New Leash on Life 20 Golden Oldies. 200 Great Prizes - Check some out ! Sign up below and we will notify you by e-mail. Proceeds go to support Cairn Terrier Rescue. Simply check off the boxes below that are of interest to you. SIT BACK, RELAX, and we will do the rest. We will send you timely up-dates by e-mail on the items you selected. Any information provided to CPCRN will be kept confidential and will not be used for any other purpose or solicitation. Special Cairn Terrier items available for purchase on this web site. We have quite a few exciting surprises that will be offered soon! The Col. Potter Cairn Rescue Network (Not-For-Profit in the State of New York) will be happy to give anyone who donates any items a tax receipt. Your generosity is always sincerely appreciated. Please contact me. I want to donate items that could be sold through auction on eBay. I realize that these items do not have to be Cairn Terrier related. 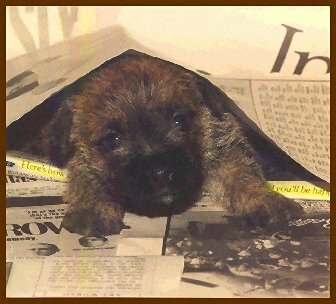 I would like to submit a story or art for Written In Stone - great stories of beloved terriers. I'm creative or artistic and I want to help somehow. Contact me, let's talk! I have dog equipment or supplies that are in good condition that I would like to donate to a foster care home. I would like to help foster Cairn Terrier Rescues or help with their expenses or grooming. I have a rescue dog whose photograph I would like to have in your next rescue calendar. I am interested in helping rescue financially with a one-time donation or by establishing other long-term endowments. Please contact me. Please remove me from your notification list. I have filled out the information on the top of this form with my name and e-mail address.